This blog was authored by Warren Mercer and Paul Rascagneres. 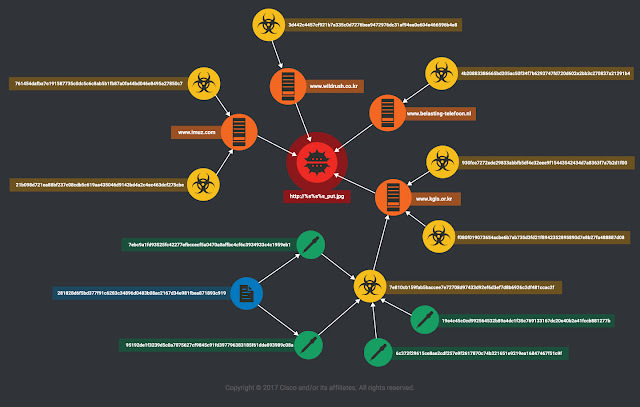 Talos has investigated a targeted malware campaign against South Korean users. The campaign was active between November 2016 and January 2017, targeting a limited number of people. 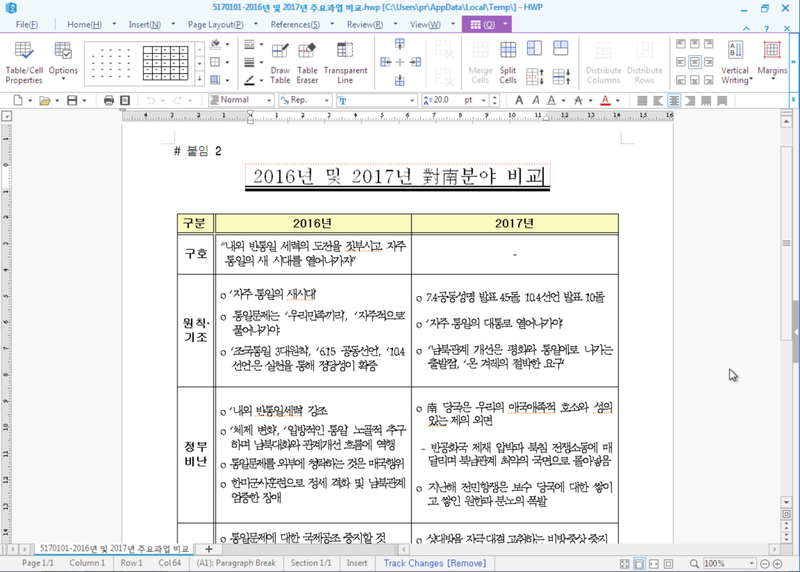 The infection vector is a Hangul Word Processor document (HWP), a popular alternative to Microsoft Office for South Korean users developed by Hancom. 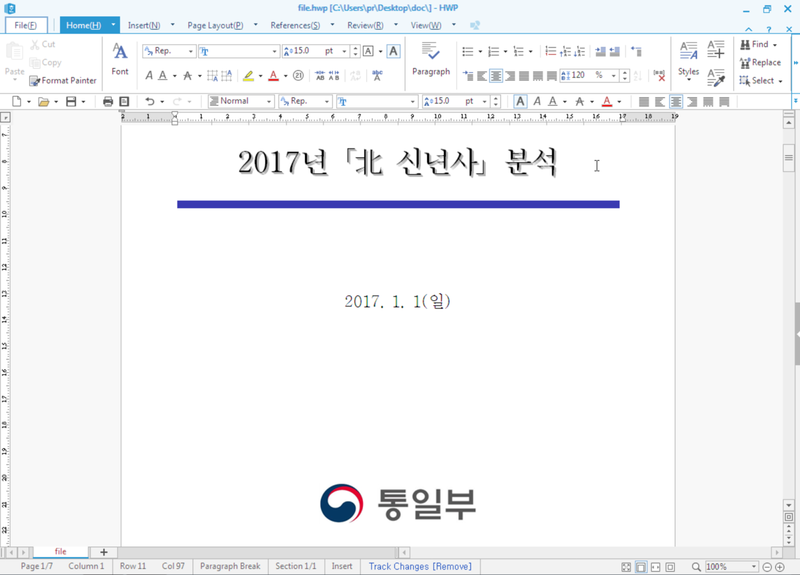 This document was alleged to be written by the Korean Ministry of Unification and included their logo as a footer on the document. An interesting twist also came within the analysed malicious document as it attempts to download a file from an official Korean government website: kgls.or.kr (Korean Government Legal Service). The file downloaded is a binary masquerading as a jpeg file that is later executed as part of the infection. It's likely that the website was compromised by the attackers to try and legitimise the HTTP GET attempts for the final payload, this traffic would potentially not have looked unfamiliar for any system administrators. The attackers' infrastructure appeared to be up for a few days at a time with no observed infrastructure re-use occurring. Unfortunately, the compromised sites were all either cleaned or removed by the attackers and Talos were unable to obtain the final payload. This level of operational security is common for sophisticated attackers. Due to these elements it's likely that this loader has been designed by a well-funded group in order to target public sector entities in South Korea. Many of these techniques fit the profile of campaigns previously associated with attacks by certain government groups. The infection vector identified by Talos is a HWP file. This is a fairly unusual choice as this software is rarely used outside of Korea, but it is known to be widely used within Korea, including use by the South Korean government. 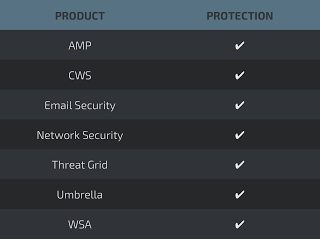 As a regional file format, many security devices are not equipped to process HWP files. This can allow an attacker a vector with a much lower risk of detection by any security scanning devices. 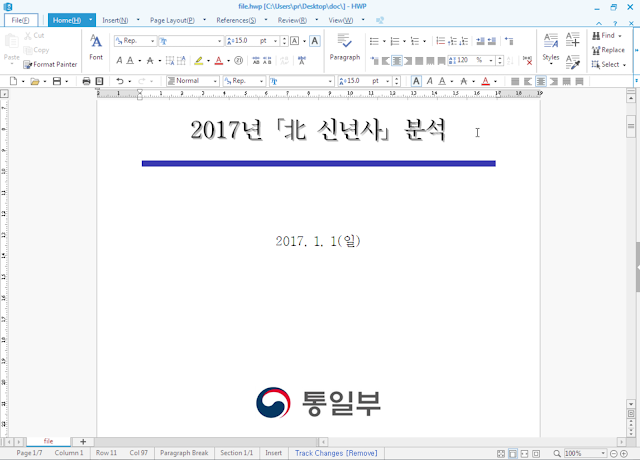 The title of the document is "Analysis of "Northern New Year" in 2017". The logo at the bottom of the document in the logo of the Ministry Of Unification. This ministry is working towards the reunification of North & South Korea. The document describes information linked to the North Korean celebration of New Year. At the end of the document are 2 links to additional documents. 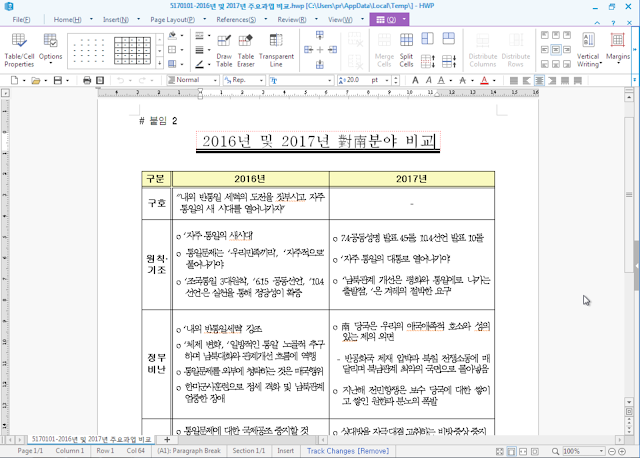 The malicious document mentions that users should double click in order to access to these documents, Document1 is identified as "Comparison of Major Tasks in '16 & '17" and the Document2 linked is identified as "Comparison between '16 & '17"
Once decompressed (zlib), we identified two PE32 files embedded within the 2 OLE files. If the targeted user double clicks on one of the links, a PE32 file is dropped and executed. The compilation path of the binaries was not removed which allows us to determine the working space and environment used for this attack. Download a payload from a compromised host/C2. Like the previous document, this one speaks of the relation between North Korea and South Korea, and is seemingly written by a native Korean speaker due to the specific language used. VirtualAllocEx(), WriteProcessMemory() and CreateRemoteThread() APIs. This information could be used as a reconnaissance phase to determine if there was a suitable platform to deliver the final payload and to avoid sending the final payload to sandbox systems. The beginning of the jpg document (02BC6B26) is the ID previously generated. We think that the jpg file is automatically generated by the index.php file if the collected data is relevant. The content of the jpg file is saved in a file called 'officepatch.exe'. Finally, this new file is executed and the unpacked executable terminates itself. The website kgls.or.kr is the web site of the Korean Government Legal Service. Talos can only assume that this website was compromised in order to deliver the final stage malware, the jpg file. All the infrastructure was down during our analysis, which meant we were unable to analyse the payload directly. 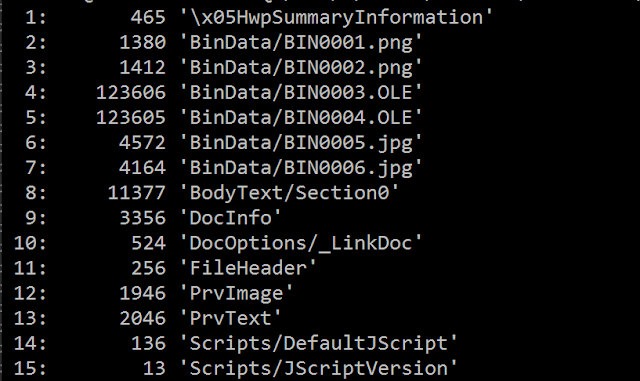 The collected binaries are compiled between 22:43:05 UTC and 4:55:18 UTC (the 3 files at 22:00:00 are the binaries dropped by the HWP document and the other files are the unpacked payload) - Time Stamp artifacts can be easily faked and can be deployed as a false flag mechanism to make the researcher believe the compiled code came from a certain Time Zone - this should not be trusted as an indicator of where the attack or attacker originated from. This actor appears to have made intentional decisions to limit the attack surface by using Hangul. This allowed them to evade some security devices as this format is not frequently processed. The infection process was a MalDoc with multiple droppers (identical in their execution) and then C2 communication to obtain the final payload. The use of decoy documents is very common and shows that the attacker wanted to use a social engineering / enticement aspect to encourage the users to open the file. This campaign has clearly targeted at a specific group of users, this rings true with the use of such specific file formats. Steps were clearly taken to limit the ability of security products to detect the threat as well as adherence to a strict timeline to prevent the malicious files from being discovered. The attackers were careful to remove their malicious payloads and not re-use their infrastructure. We believe this is a targeted attack aimed at South Korean users in the public sector conducted by a sophisticated threat actor with access to native Korean speakers. Attacks on these individuals may be an attempt to gain a foothold into assets which can be deemed extremely valuable. Hello, I try to reproduced. I extract the two OLE files with oledump.py, but I can't decompressed it. I didn't show zlib headers. Can you explained more in details how you did it ? The OLE objects are compressed with zlib without header. You must deflate them in raw.